ATLANTA (Thursday, February 14, 2019) – Calling all foodies! ATL Airport District is gearing up to host its sixth annual ATL Airport District Restaurant Week taking place from Saturday, March 9, through Sunday, March 17, 2019. During this nine-day culinary celebration, patrons are invited to enjoy top restaurants throughout the cities of College Park, East Point, Hapeville and Union City, Ga.
Attendees will be able to dine at a wide selection of local favorites, ranging from classic Southern fare to contemporary restaurants with a twist. Featured restaurants throughout the District will offer $9, $19 or $29 prix fixe menus or signature dishes at a 20 percent discount. All menu prices will be valid for brunch, lunch or dinner and exclude alcohol, tax and gratuity. Presented by ATL Airport District and Phase 3 Marketing & Communications, with media support from Atlanta Eats, ATL Airport District Restaurant Week will kick off on Saturday, March 9. 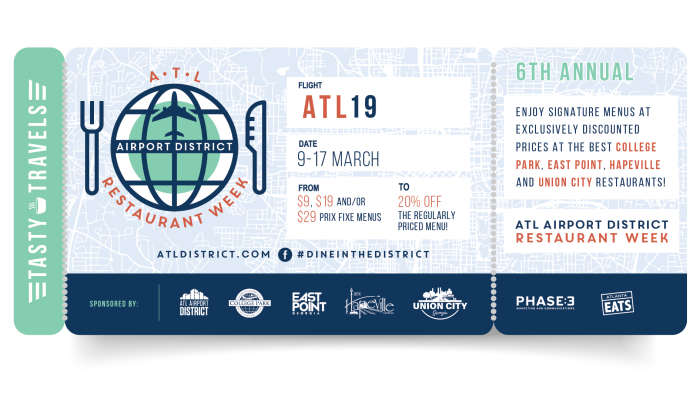 For more information regarding ATL Airport District and Restaurant Week, visit www.ATLdistrict.com or follow along on Facebook, Instagram and Twitter using #DineInTheDistrict and #ATLdistrict. ATL Airport District is the official convention & visitors bureau for the cities of College Park, East Point, Hapeville and Union City, Ga. The mission of ATL Airport District is to generate economic development for the cities of College Park, East Point, Hapeville, and Union City by effectively marketing the community as a preferred tourism, convention and meeting destination. For more information, please visit www.ATLdistrict.com.